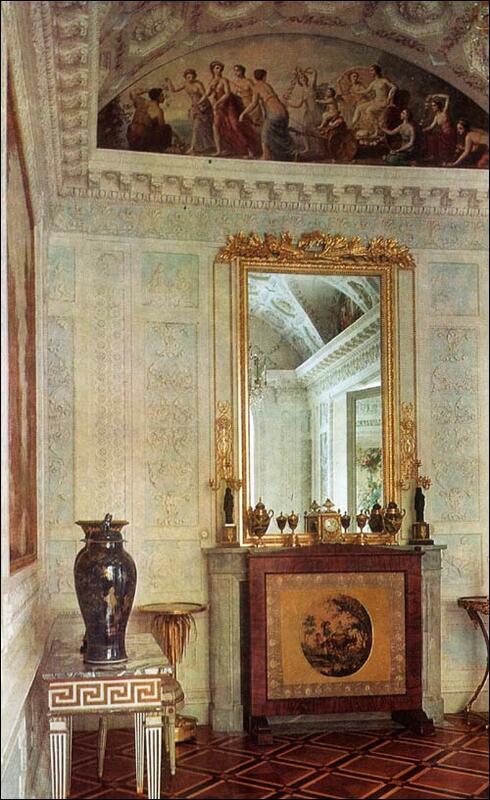 The Dressing Room of the Empress, which terminates the southern suite, is one of the smallest apartments in the palace. It is elegantly ornamented with stucco mouldings, classical bas-reliefs by Ivan Prokofyev, and panels with views of the Pavlovsk Park painted in fresco by Andrey Martynov and Giovanni Scotti. The fine white moulded ornament on a background of pale blue, and the dainty garlands of roses lightly traced on the coffered vaulted ceiling, give a rare charm to this room resembling a piece of Wedgwood ware. Opposite the balcony door is the end wall of the Picture Gallery. 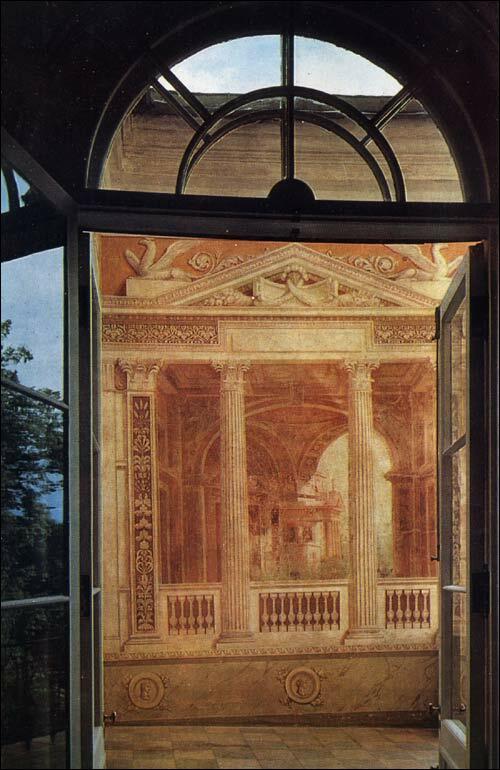 To reduce the unpleasant effect of a surface closing the view, it was painted in fresco with a magnificent portico of a classical building with columns, an inner court and an arch. This illusionistic perspective is the sole surviving fragment of those parts of the original mural decor of the palace, which were painted by Gonzaga. Remarkable among the furnishings of the room is the dressing-table with a mirror on a box stand flanked by vases, a chair and a footstool, and other objects of Tula steel, decorated with gilded bronze, silver encrustation, and thousands of steel "diamonds", each of them executed individually, faceted and polished, and sparkling like a precious stone. This masterpiece was created in 1788-89 by a craftsman named Semion Samarin. Art objects in steel were produced by the gunsmiths of Tula in their spare time, at home. 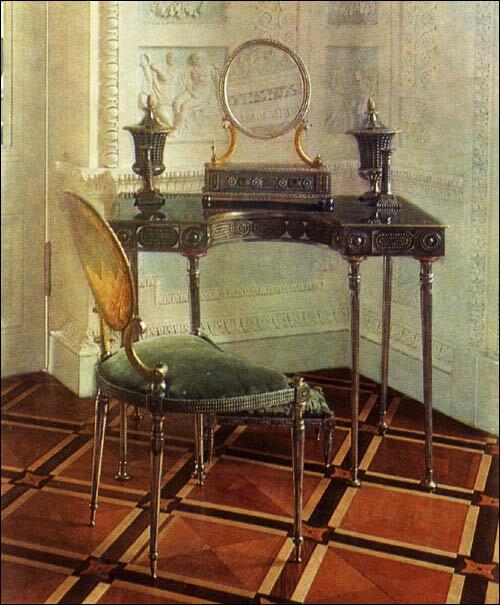 The acme of perfection in the technique of cut steel is a small working-table with a footstool, made at Tula in 1801. It consists of more than 10,000 individually forged details forming a fine openwork design, enlivened with blueing, ormolu and gold encrustation. The Pavlovsk collection of cut steel work illustrates the entire range of techniques employed by the Tula craftsmen. Originally the Dressing Room of the Empress Maria Feodorovna was laid out on the same plan as that of Paul I: it was also an oblong with an apse at each end, embellished with painted panels showing architectural landscapes. When the new state apartments in the southern section of the palace were built, however, Brenna altered the Dressing Room to provide a link between the central and the southern blocks. He made it smaller, using a part of it, together with two other small rooms, to create a new apartment for the ladies-in-waiting in attendance upon the Empress. The decor of this apartment is modest, in keeping with its original function; the walls are faced with white and lightly coloured stucco panels framed with graceful mouldings.